Here is on of the cards we created during annual Stamp A Stack this Saturday. 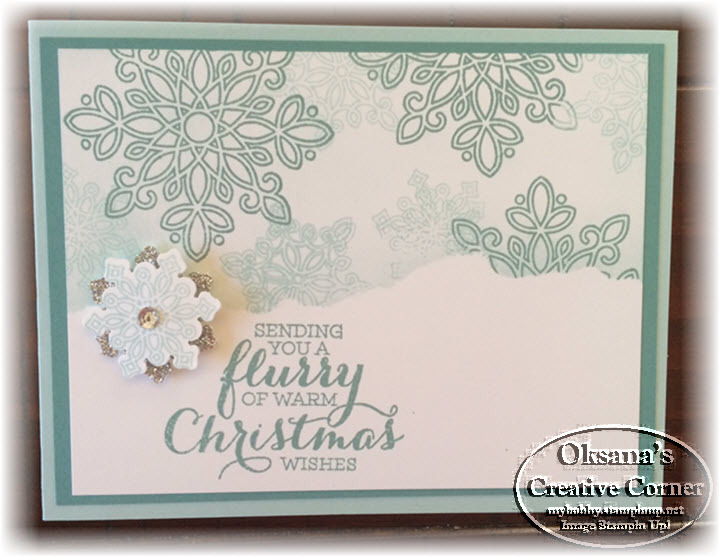 Many choose this card as their favorite for easy design and creative elements. From 20 cards of this design - there were no two alike. Cut Soft Sky 5 ½ X 8 ½ Fold in half. Cut Whisper White 3 ¾ X 5. Take a piece of scratch card stock and tear in half. Hold over the bottom half of the piece of Whisper White. Sponge lightly the top portion focusing mostly on the seam with Soft Sky ink. Stamp your snowflakes in Lost Lagoon, and Soft Sky. Take away the torn piece of card stock. Stamp the bottom with the greeting from Flurry of Wishes in Lost Lagoon. Adhere white piece to 4 x 5 1/4 piece of Lost Lagoon and than to Soft Sky card base. Stamp the smaller snowflakes with Soft Sky and punch out the smallest one with the Snow flurry punch. Punch smaller snowflake from silver glimer paper. Add to the front of the card with Stampin’ Dimensionals, and embellish with a Basic Rhinestone. You can buy anything you may need in my Online Store. Hope you will give this card a try. Flurry punch is on the list!